My father's library included an omnibus volume of the works of Robert Louis Stevenson. I've posted before about Treasure Island, a book I re-read so many times that by the time I was in third grade I could recite many passages from memory. Also included in the omnibus were The Black Arrow, set during the Wars of the Roses, and The Strange Case of Dr Jekyll and Mr Hyde, which I should probably have first read when I was a bit older. Apart from the pirate tale my favorite Stevenson was (is) Kidnapped, set in Scotland in the mid-18th century not long after Bonnie Prince Charlie's failed attempt to reclaim the British crown for the Stewarts. Years later I discovered the editions of these books published early in the 20th century by Scribners with illustrations by N.C. Wyeth. I have never seen better illustrations for Stevenson's stories. 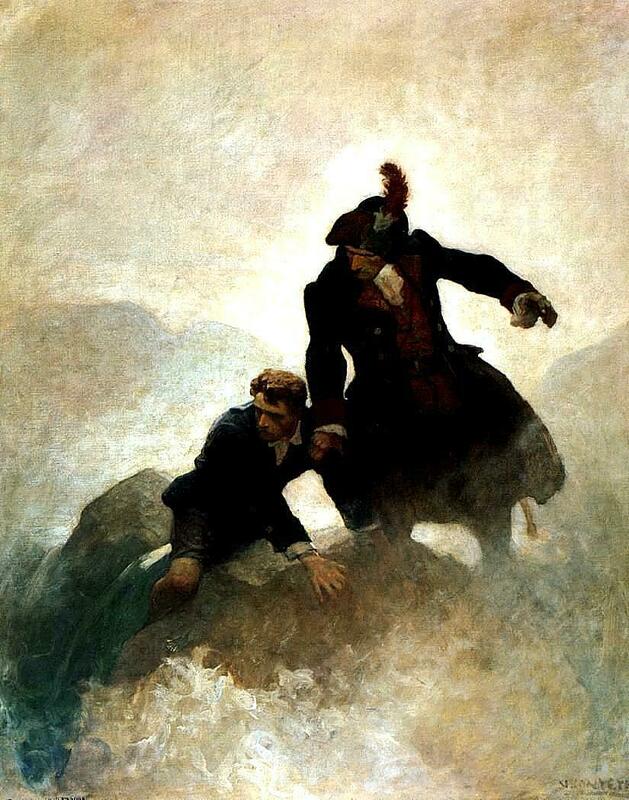 Wyeth illustrated several of the books including Treasure Island, The Black Arrow, and Kidnapped. This one is from Kidnapped and is a favorite of mine.